california power systems caters to the US ultralighter. they have fuel lines on their website. you are using hose clamps too correct? i've found the best ones are on bevelheaven.com look under carb parts. they are for ducati and motoguzzi bikes. oh and about the 1/64th hole. 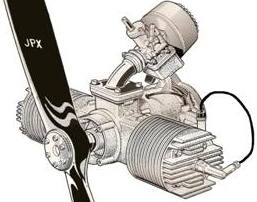 i can't find the article, but it said to mount the mikuni pump with the vacuum hole inlet downwards. then, on the face of the mikuni pump, there is a backwards boss (don't know the correct casting term for this) or a depression - take a pin chuck and a 1/64th bit in your drill press, and carefully drill the tiny hole through this part, so there is a hole for any oil that accumulates in the pump diaphragm gathered from the oil in the impulse line, the oil can leak out after you've shut down, but the hole isn't big enough to hamper the effectiveness of pump itself. solved my problems on the JPX.